Arcata has backed down from its 4/20 crackdown, granting a picnic permit to the Humboldt Center for Constitutional Rights, which had raised a stink over the police department's shutdown of Redwood Park on the lofty counterculture holiday. In the late 2000s, pipe-bearing revelers converged at the grassy entrance to Arcata's Community Forest, forming an unofficial celebration that vexed cops and groundskeepers. A complaint filed against the city last year alleges that the police chief and former city manager concocted a plan to quash the celebration, violating the constitutional right of residents to gather in a public place. That suit is pending. But HumRights, which had been in the process of applying for an event permit at the park since last year, recently notched a victory. The city had initially denied the permit, saying the police department had a standing reservation that day for "public safety operations" (during which they littered pathways with debris and heavily fertilized the grounds with noxious fish emulsion, according to the aforementioned complaint). But following a review in March, City Manager Karen Diemer agreed to let the group host its "Inaugural HumRights Picnic Gathering" on April 20 from 2:30 to 6:30 p.m. There are some caveats: no stage use, no alcohol and no smoking. "I remind you that the smoking prohibition includes tobacco, electronic cigarettes and marijuana," Diemer wrote. Perhaps most tricky, though, is that the gathering can't have more than 150 attendees. In a press release, HumRights invites the organization's friends and supporters for food, music and free speech-related events, but it's not entirely clear if the rest of the park, outside of the reserved area, will be open, or what will happen when the 151st attendee shows up. The permit states that city staff will open park gates between 2:30 and 6:30 p.m., but it doesn't say whether staff will continue its previously reported practice of turning away on-foot parkgoers. "This date has a history of attracting a large gathering at this particular park site," Diemer wrote in the permit approval. "Resulting from the history of responding to incidents on this day, the city continues to maintain a patrol presence, and enforces the park regulations as well as standard laws including smoking laws." Diemer did not return a call seeking comment by press time. Regardless of the attendance, the city's softening gives credence to concerns that blocking off the park constituted prior restraint. "We feel this permit, albeit limiting, is an important first step in HumRights' efforts to keep a public park open to the public," the group's executive director, Jeffrey Schwartz, said in a statement. 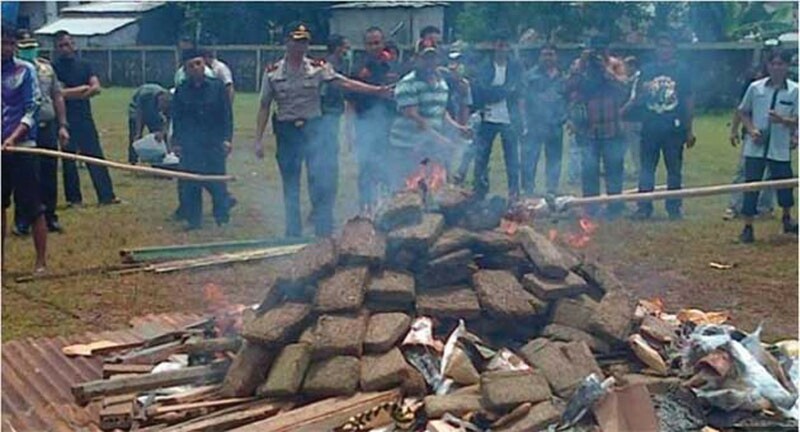 Whatever party HumRights whips up, there's no way it'll be as good as the one Indonesian police inadvertently threw for nearby townspeople when officers burned three tons of confiscated weed, sending clouds of smoke and good vibes through the streets. "Local residents were admitted was dizzy inhaling the smoke of burnt marijuana. But heck usually when inhaled smoke marijuana, dizziness make tasty."